Every now and again, despite thinking you know a city like the back of your hand, you discover a hidden gem you’ve walked past a hundred times and managed to miss. Gillray’s Steakhouse is that place. Reached via a little gate off the Southbank inside the imposing County Hall building, overlooking the Houses of Parliament, it’s huge, and yet tucked away. Like a grand old English hotel, the cocktail lounge is a Mecca for gin lovers – a huge circular room with floor to ceiling windows overlooking Big Ben and an awesome selection of 68 gins on the back bar. The cocktail list (which does feature other spirits too) is ordered by era beginning with the Victorians (think Empire-themed concoctions using exquisite boutique gins and rums) through to the present day (botanicals, molecular cocktails, herb infusions). We went for The Warm Recall – Haymans Dry Gin with pineapple, caramel, orange liqueur and fresh ginger – intended to bring back that warm glow of your last holiday (incredibly, it did) plus a fresh Basil and Blood Orange-infused vodka martini. Both were sensational. Dinner kicked off with one of the most unusual entrees; instead of the usual bread basket, a Yorkshire pudding stuffed with melted cheese was quietly set on the table. ‘Don’t knock it till you’ve tried it,’ smiled the waiter sensing our scepticism. It sounds wrong, but was surprisingly light like a croissant – and dangerously moreish . We followed with the Cornish Oysters, again – rather controversially – baked with sage and cheddar rather than raw (which surprisingly worked) and giant fresh Grilled King Prawns accompanied by a rich tangy lemon garlic and parsley sauce. Pure pleasure. Gillray’s prides itself on being proudly British in theme – clearly popular with American tourists wondering in from the Southbank. But the quality of the food here is anything but gimmicky fare for outsiders. Head chef Gareth Bowen has worked for Michelin starred restaurants all over the world and has 17 years of experience. Previously at the 5 star London Marriott Grosvenor Square, he was responsible for all aspects of dining including Banqueting by Gordon Ramsay. His touch is evident in the clean non-fussy presentation of the food and the superb quality of the locally-sourced ingredients. Our main courses of Yorkshire grass fed Rib eye Steak and South Coast Lemon Sole and Parsley Butter were both perfectly cooked. The steak was tender and awesomely rounded in flavour while the fish was delicate, light and melted in the mouth. Gorgeous. The side orders were balanced little meals in themselves – Bubble and Squeak, Chili roasted local Squash and purple sprouting broccoli with Yorkshire blue and hazelnuts. Not surprisingly we couldn’t manage a desert each but the Dorset Batter Pudding with blueberries and clotted cream was big enough for four to share and may just have finished us off if we’d had more than a spoonful each. Delicious but not for the fainthearted. We’d rate the meal highly with the female sommelier perfectly matching each of our dishes with one of the excellent well priced wines that come by the glass. The food here was great – if a little on the heavy side – but the service impeccable, with the entertaining team of mixologists at the bar clearly knowing their stuff. 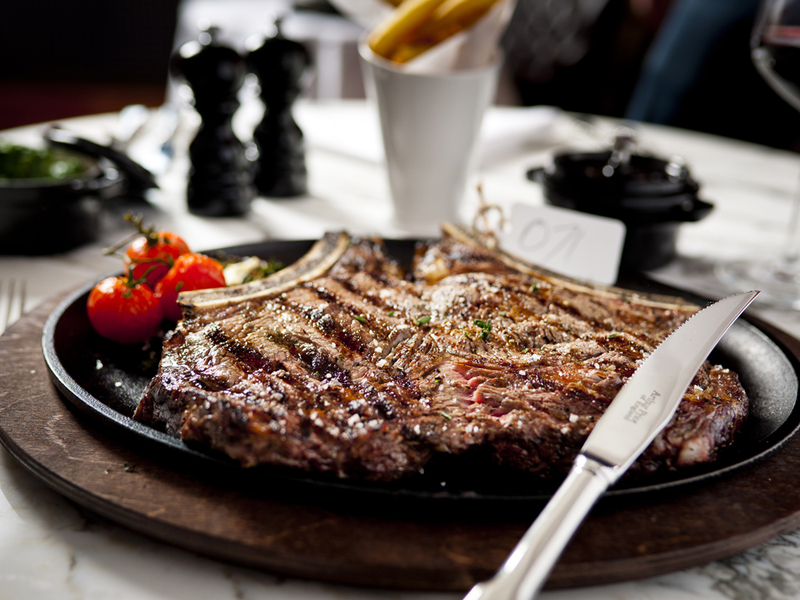 Gillray’s is a restaurant with a real sense of occasion thanks to its breathtaking views. It’s also a great place to bring your ‘out of town’ friends wanting a real taste of Britain. Just make sure you come when you’re really hungry. Three courses without wine approx £50 per head.